Like putting an air purifier in every room. 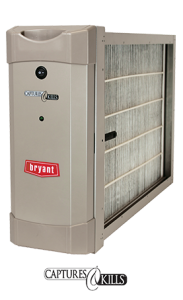 Compact enough to fit most tight furnace/fan coil installations, this whole-home air purifier can be the perfect fit for cleaner air and efficient system performance. It silently eliminates up to 75% of organisms as small as .30 micron. And, with Captures and Kills™ technology, it is proven effective against 3 common pathogens, including the common cold and human influenza.